a baking tray inside. 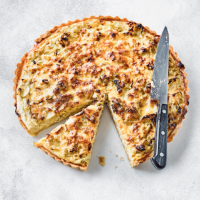 Roll out the pastry on a floured surface and line a 28cm quiche tin. Prick the base with a fork and chill for 15 minutes. 2.Meanwhile, heat the oil in a frying pan and fry the leeks for 5 minutes. Remove and leave to cool. Place the haddock and milk in a pan, cover and poach gently for 4-5 minutes. Drain, reserving the milk. Dry the fish on kitchen paper. 3. Line the pastry case with foil and baking beans and bake blind for 10 minutes. Remove the beans and foil and cook for a further 10 minutes. Flake the haddock and scatter over the pastry base and top with the leeks. 4. Mix together the eggs, cheese sauce and 100ml of the reserved milk and pour over the mixture. Sprinkle with Cheddar and bake for 40-45 minutes until set and golden.